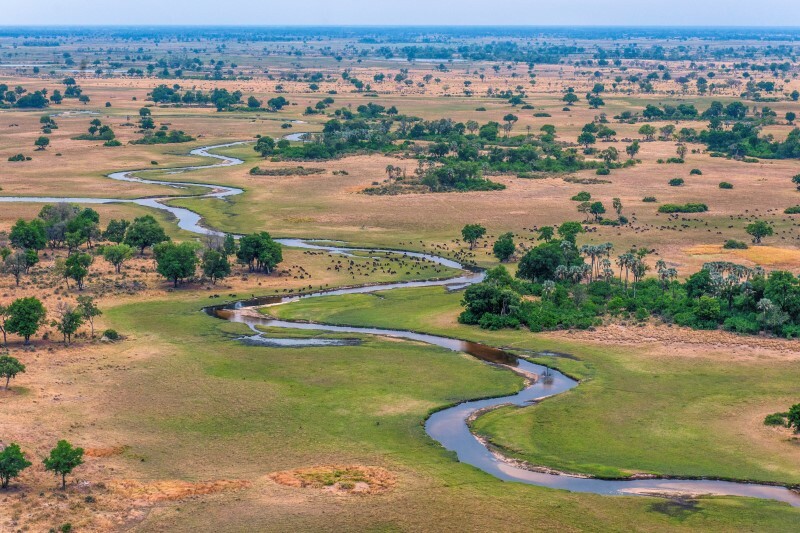 Richard van Ryneveld indulges in the miracle of Moremi in Botswana, taking in the incredible natural beauty of the Okavango Delta from both land and air. 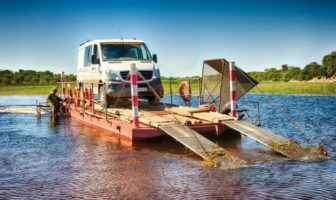 “Guys, get your trailers and tents set up… I think we’re in for a helluva storm,” said Jannie Rykaart. 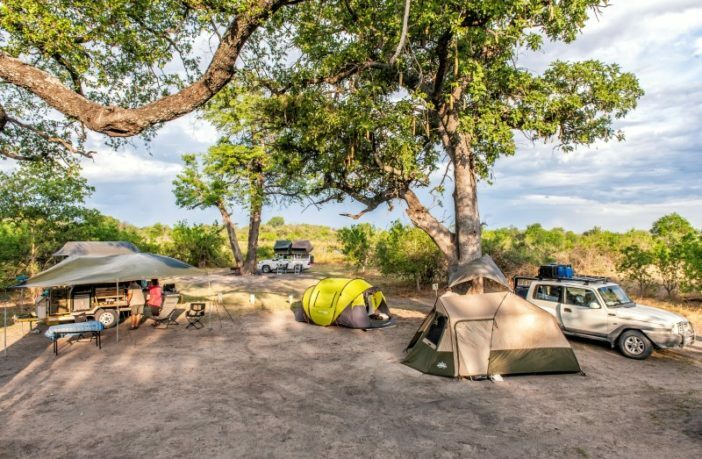 It was the first night of our trip to Botswana. There had already been flashes of lightning and the dull roar of thunder in the distance. 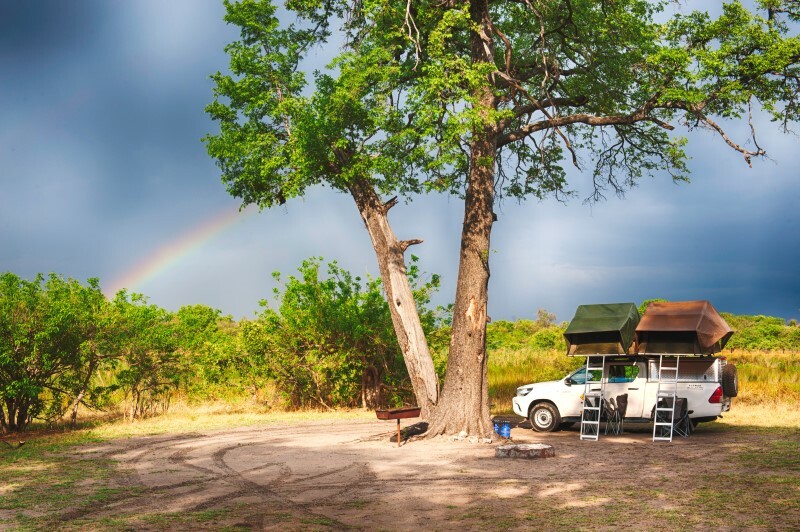 We were at the Khama Rhino Sanctuary on the main road between Serowe and Orapa, and a storm that would keep any Gautenger happy rained down that night. 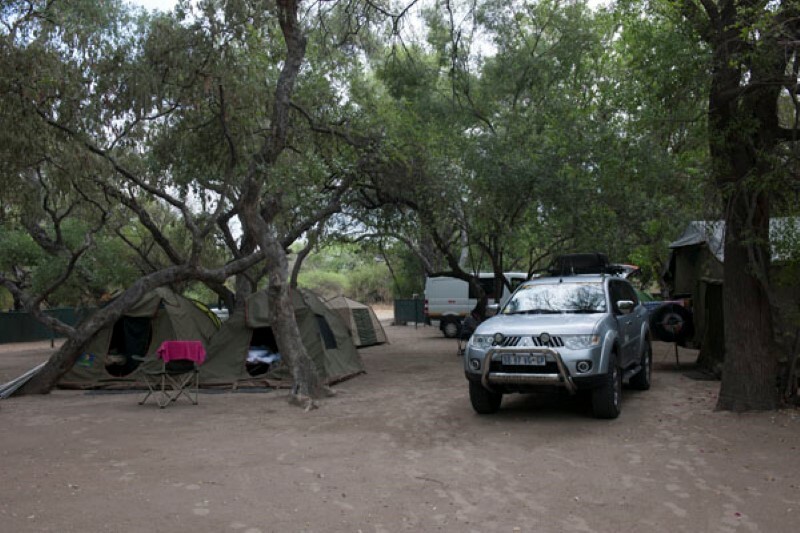 The next morning, we woke to the earthy smell of the bushveld after rain and to the sounds of a big flock of Southern pied babblers chattering near our camp. A pair of grey loeries nipped at Ouma-rusk crumbs around our breakfast table while the ubiquitous Glossy starlings preened themselves in the branches around Jannie’s van. 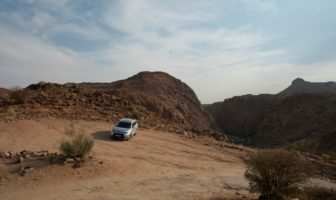 We were only four vehicles and eight people on this trip. It is possibly somewhat selfish of me, but I like small groups when travelling. Time to introduce the team. 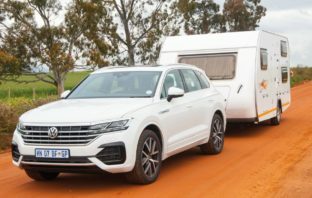 Jannie and Ansu Rykaart are known for small, very-well-organised trips with a good dollop of luxury. 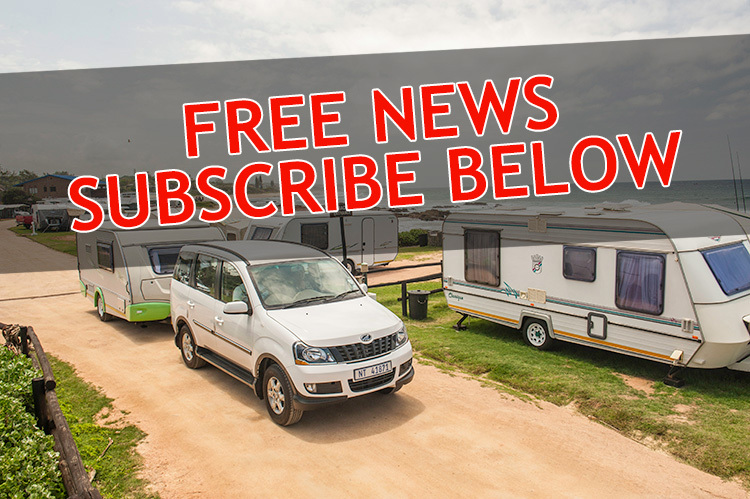 The four vehicles were firstly Jannie and Ansu’s Pajero Sport 3.2 DiD, towing a Conqueror Comfort off-road camper. Then there was Ian Kempe, a civil engineer, travelling with his daughter Laura in a short-wheelbase SsangYong Musso. I thought Laura was still at school, until I learnt that she was a qualified doctor, specialising in anaesthetics! 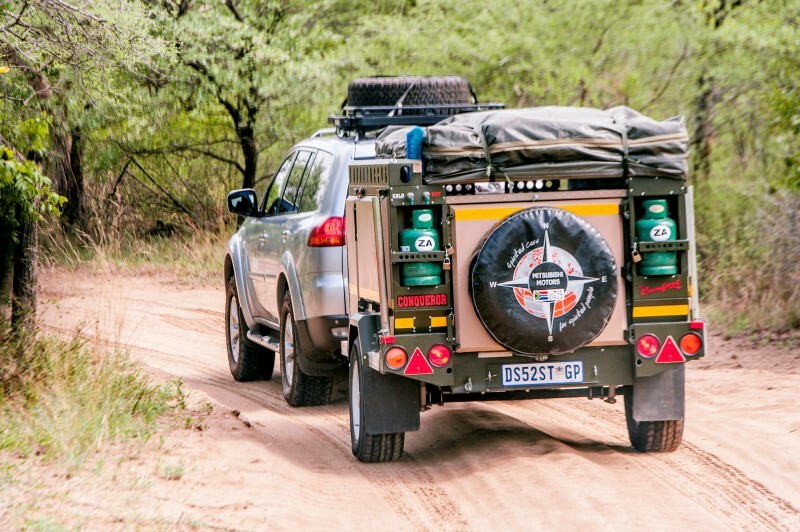 Travelling in a SWB Pajero and towing an off-road-capable Venter trailer were Stan Stacey and his friend Cilito Brookstein. On one of the days, I saw Stan wearing a T-shirt with something about the North Pole printed on it, and discovered that this quietly-spoken man had been to the North and South Pole, among many trips to other far-flung parts of the world. He had also travelled on many of the Protea Safari trips with Jannie. 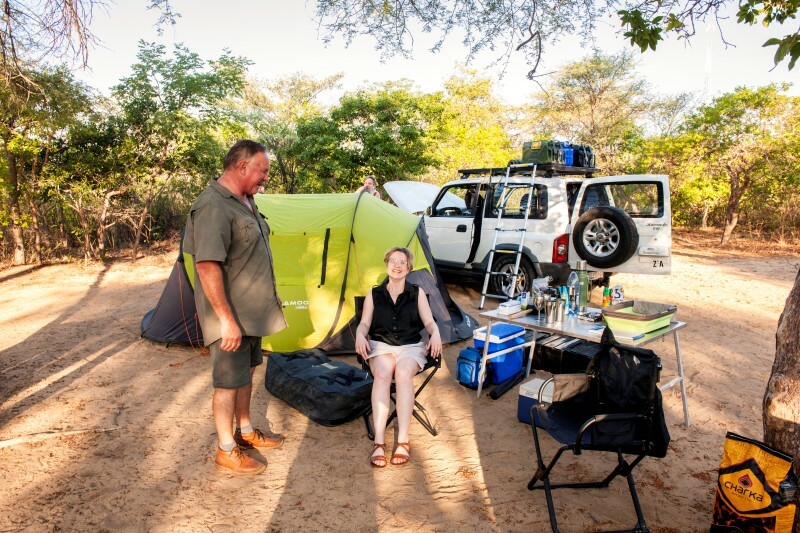 My partner in crime and co-driver was Kobus Theron, whom I had met on the Soutpansberg trip that I had done just before this Botswana mission. 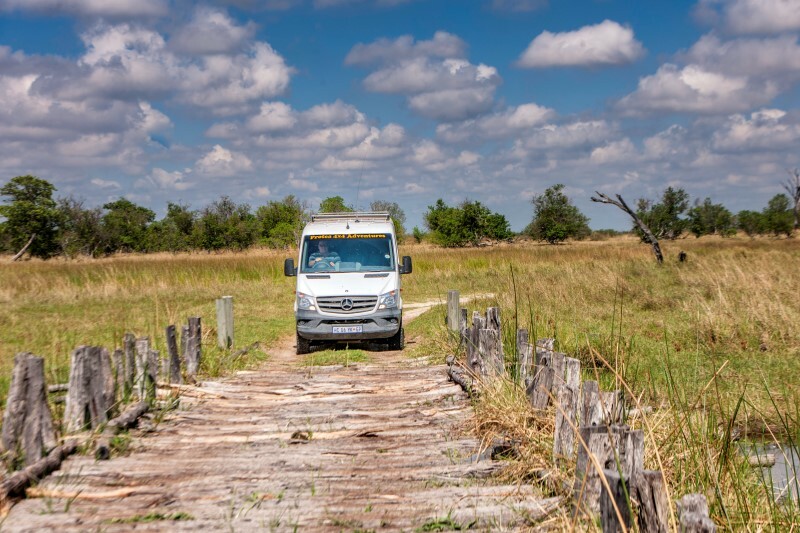 We hit the road in real luxury, driving a Mercedes-Benz Sprinter. 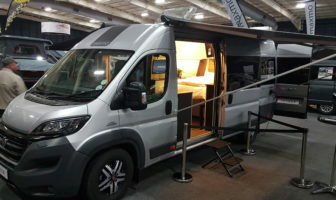 This vehicle, basically a commercial van, was an absolute pleasure to drive. Spacious in the extreme, it had room for Africa. 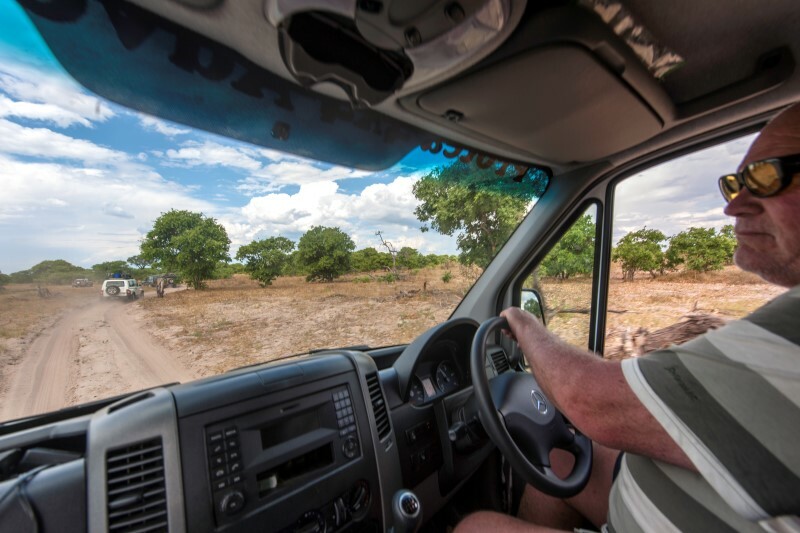 Kobus did a lot of the driving, especially in Moremi and the Makgadikgadi National Park, while I sat in the back on a camp chair with my tripod. 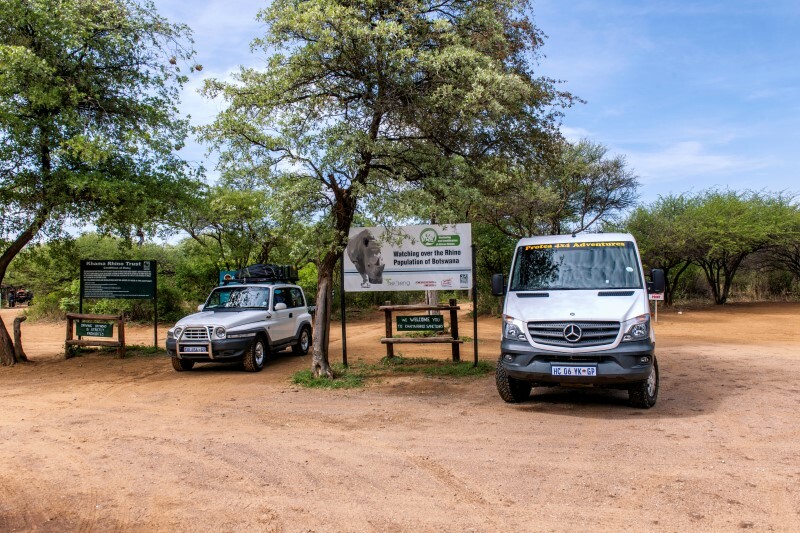 I could photograph from either side of the Sprinter, thanks to Kobus’s unselfish offer to drive for most of the time in the game reserves. 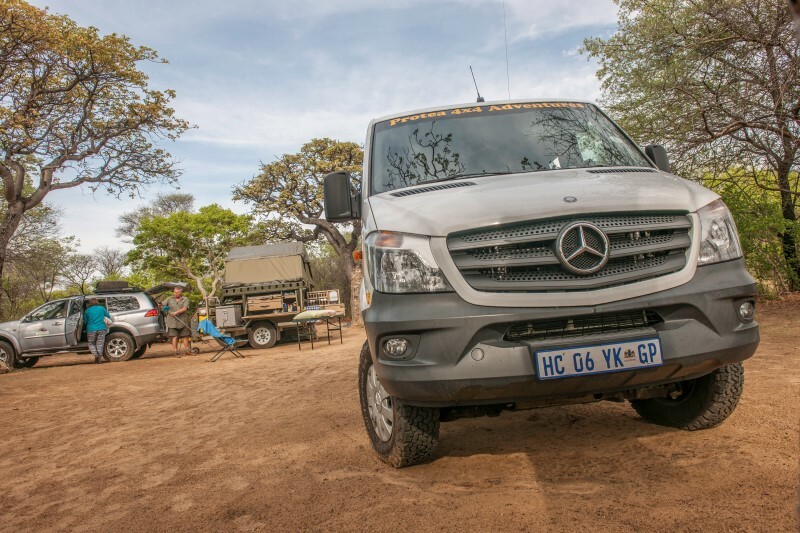 I’m convinced that Jannie from Protea 4×4 Safaris has a direct line to the wildlife on his tours. On a short drive before setting up camp on our first night, we went down to a small pan nearby. In the light of the setting sun, we saw a long line of eland sipping at the water, and later a rhino with her calf joined the throng. During the drive back to camp, we saw springbok, impala, red hartebeest, a jackal, and a Kori bustard. 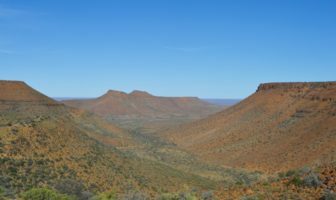 The Khama Rhino Sanctuary is situated on the main road between Serowe and Orapa, approximately 650km from Johannesburg, and is a popular spot with the birding fraternity. There are hides situated around the sanctuary, and Jannie, in his organised way, had provided a list of birds attached to our comprehensive itinerary and packing lists. 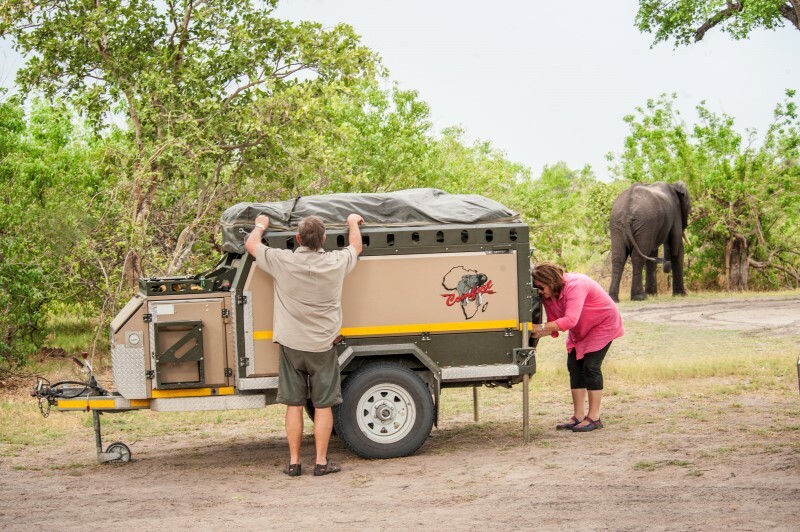 Experienced guides can also take you out on foot to track black and white rhino. Groups of eight people may go at a time. 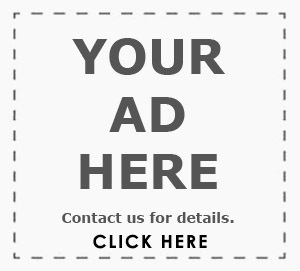 Only persons aged 16 – 60 may participate in Rhino tracking. There are 22 campsites in the Khama Rhino Sanctuary, including sites for large groups. The central feature of each site is a large Mokongwa tree that provides both character and shade. 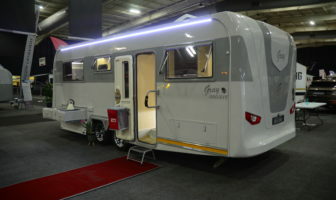 There is also a fireplace, a braai stand with grill, and a tap with a birdbath. There are no power points at the camp. This top class campsite has two communal ablution blocks. There is also a bar and restaurant at the sanctuary, and apparently a male black rhino visits every afternoon. Just remember that the rhino is wild, and don’t try to touch him! 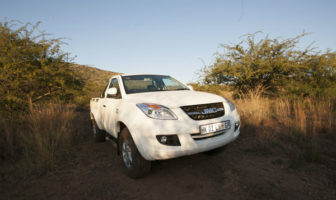 Khama Rhino sanctuary has good roads, and one can self-drive in a 4×4, or in a 2×4 with reasonable ground clearance. A map of the sanctuary is available at the office. There is a small shop that stocks the basics, including ice, cooldrinks, wood and charcoal. We also bought really first-class maps of Moremi, Chobe and the Kgalagadi Transfrontier Park. If you need to stock up with other things, Serowe is just some 25km away from the Sanctuary. There is a large Spar with an adjoining bottle store in town, as well as a service station that accepts Visa and Mastercard. From the Khama Rhino Sanctuary, we made our way up to Maun. I couldn’t believe how much the town had grown since I’d last visited many moons before. Turning right on a sandy track just out of town, I idly wondered where we were going to camp. That was in the itinerary, but on Jannie’s trips, I know that you are in for a feast wherever you roll up. The Island Safari Lodge was no exception. The lodge is set on a 300-acre private island reserve, and is situated on the banks of the Thamalakane River. 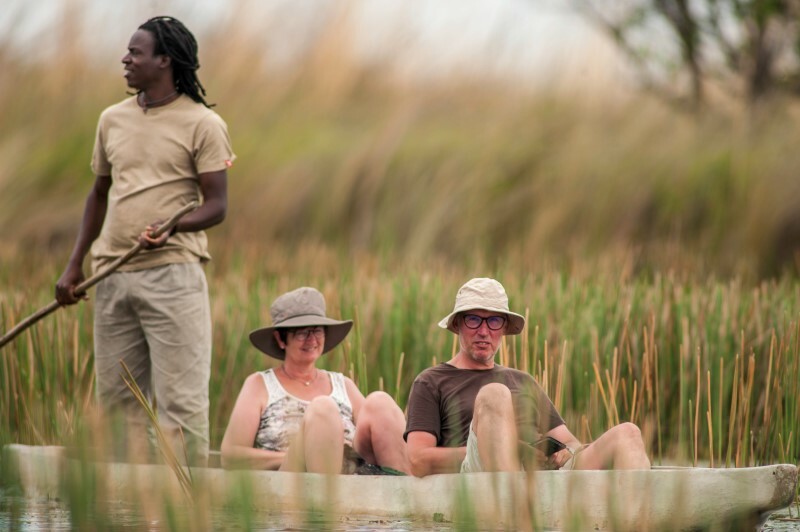 It was founded in 1973 by legendary Okavango character Tony Graham, and his spirit lives on in this beautiful location. 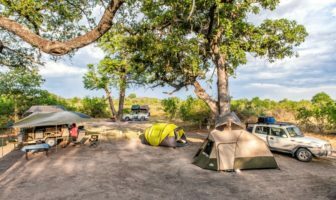 The campsite is superb: it has views of the river, tons of shade at every site, a large swimming pool right next door to the campsite, another smaller one near the bar and restaurant, and a long shaded walkway linking the camp with these and the boat dock. That haunting cry of the fish eagle didn’t let us down, either. Its evocative call was heard at the campsite all day. The camp has three ablution blocks with lots of hot water. 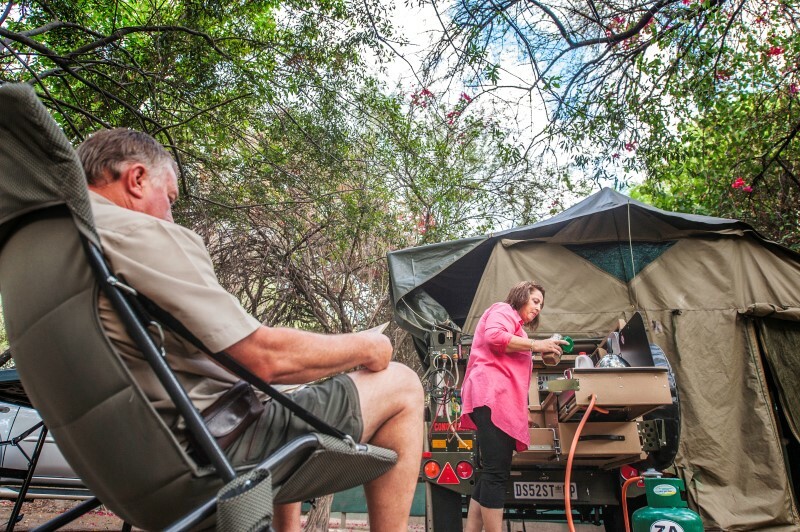 All the campsites have access to electricity and there are shared taps nearby. There are two swimming pools at the camp, with the larger one right next to the campsite. The smaller pool is close to the restaurant, pub and boat jetty. The name of the lodge refers to the fact that in high-water seasons, like other islands, it has been totally surrounded by water. 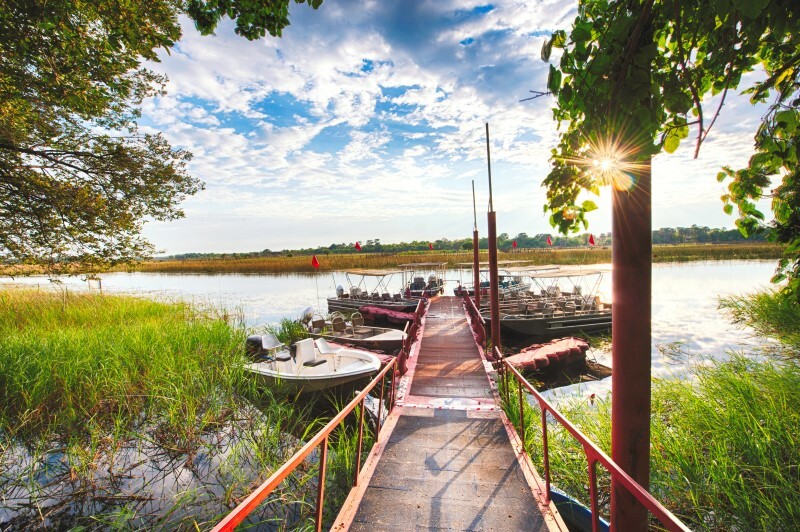 Although this has not occurred for a number of years, everyone still has fingers crossed that the annual delta flood will spill over into the Boro, the Boronyane and the Thamalakane Rivers, turning the lodge into a true island again. Well, we were in for some “island” fun, as Jannie had some real treats in store. It turned out that she was our pilot. At first I didn’t see what she was showing us. Then it dawned on me – all those black dots, literally hundreds of them, were buffalo grazing on the grass banks between the channels. 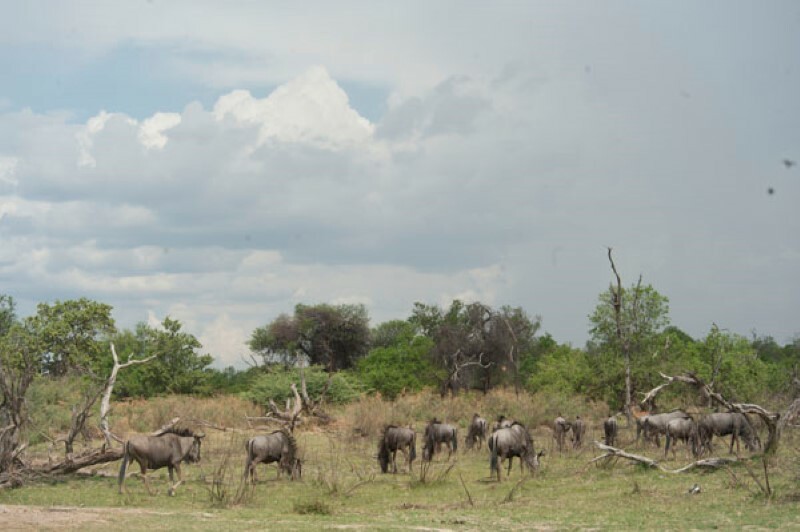 Lots of elephant, giraffe, a large herd of lechwe and some pretty nasty-looking crocs followed the buffalo sighting. 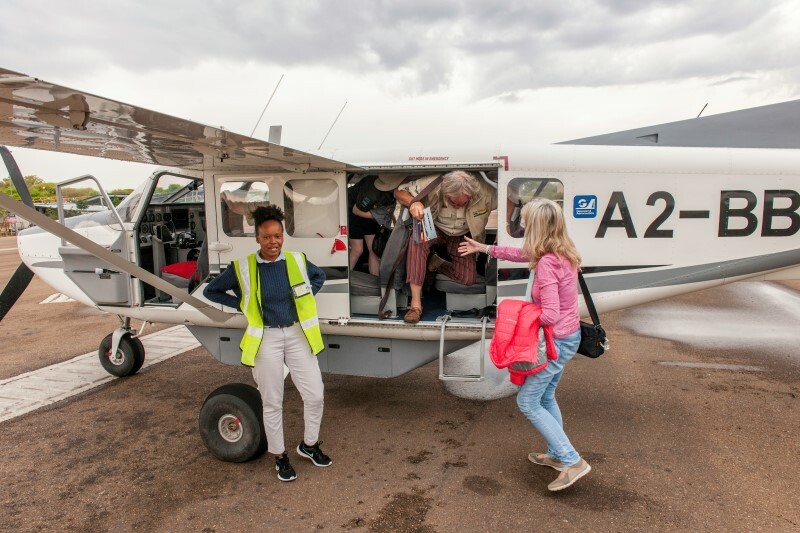 Flying literally a thousand feet above the Delta, you get some idea of the immensity of this natural miracle; some 15 000 square kilometres in the dry season, it stretches to a staggering 22 000 square kilometres in the wet season. After the hour-long flight, we headed back to camp, to discover that Jannie and Ansu had more treats in store. That evening, Jannie had arranged a sundowner-and-birding trip on an aluminium boat. The boat dock is right in front of the restaurant and pub. Accompanied by the sound of fish eagles and the sharp calls of the many pied kingfishers, we headed out from the lodge. Our guide, William, has known Jannie for years. Knowing the twists and turns of the channels like the palm of his hand, he took us on a cruise down a side channel for close-up pictures of a fish eagle, cormorants, herons and egrets; and we got pretty close to a giant kingfisher, too. William tells me that it would be possible to paddle from Shakawe at the top of Okavango Panhandle, all the way down to Maun! It would take something like a month. We enjoyed a couple of beers while heading back to our camp at Island Safari Lodge, where Jannie and Ansu had arranged a candlelight buffet dinner under the massive trees shading the riverbank. As we watched the lights of the lodge dancing off the river, the muted voices of local fishermen on the other side of the riverbank intertwined with the night sounds to form a light Okavango symphony. It was the finest ending to a magnificent day. We had to be up and ready at 8 a.m. the next morning, heading for Moremi. 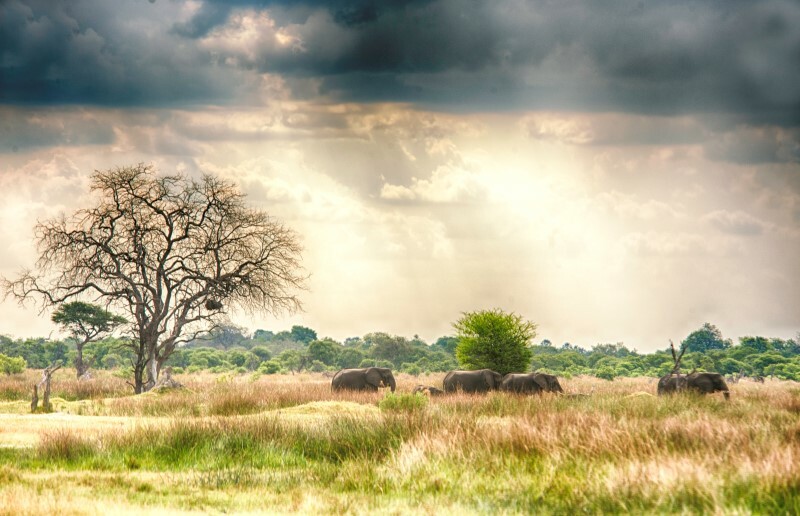 The game reserve, named after Chief Moremi of the BaTawan tribe, lies on the eastern side of the Okavango Delta. 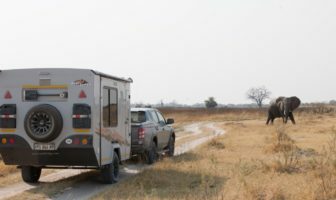 Although it is relatively small − only some 5 000km in size − due to Moremi’s unique combination of permanent water with drier areas, it is a place of contrasts: it combines floodplains and lagoons with mopane woodland, riverine woodland, and acacia forests. 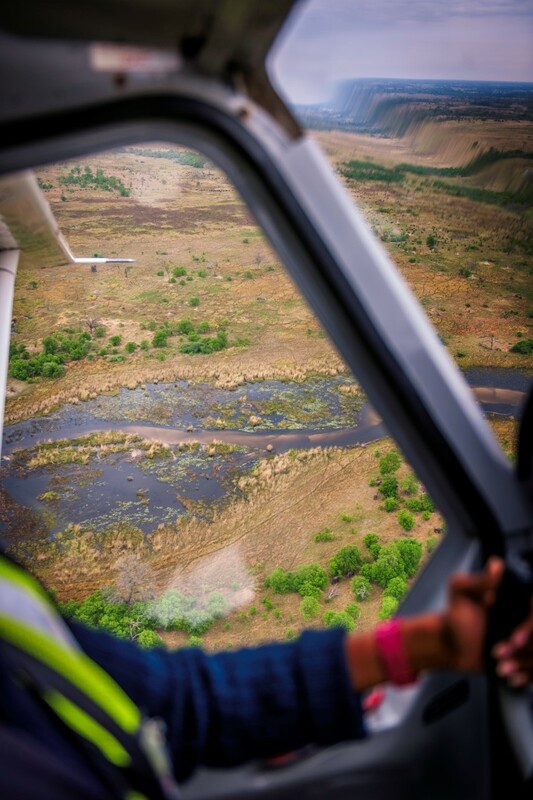 Roughly a third of the reserve is mainland, with the larger part falling within the Okavango Delta itself. 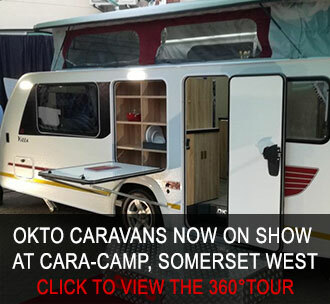 It’s undoubtedly one of the most exciting places on the African continent to view game. 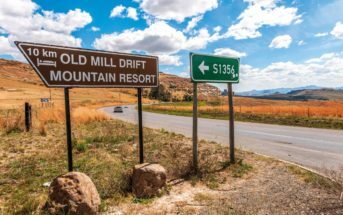 It is expensive to stay in this area, but the policy of high yield/ low impact means that visitors get to experience Africa as it was a hundred years ago. 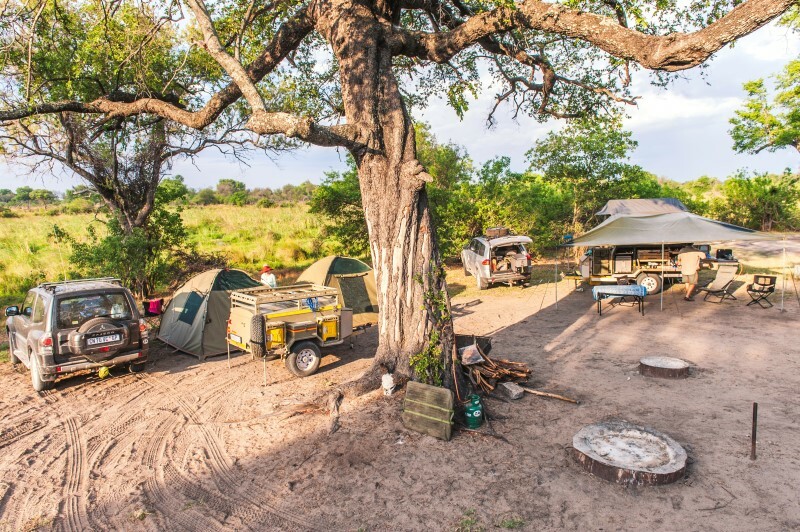 Moremi also has very few lodges, and only four camping areas – South Gate, Third Bridge, Xakanaxa and Kwai. We were on our way to Third Bridge, via South Gate. 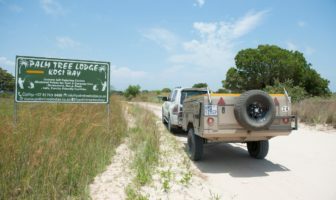 This was my first visit to Moremi, and I could hardly wait. I already knew from Jannie’s meticulous itinerary that there were over 500 species of birds, and the list of animals that followed was mind-blowing. These included Cape buffalo, giraffe, black rhino, elephant, lion, zebra, hippopotamus, cheetah, hyena, jackal, impala, red lechwe – and, if the visitor is really lucky, wild dog. 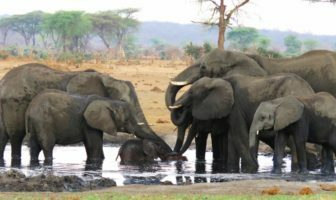 Before we had even reached South Gate, we had seen impala, wildebeest, warthogs, elephant, wattled cranes, Goliath heron, zebra and giraffe; and, when we arrived at Third Bridge camp, there was a large young bull elephant strolling next to the ablution block. Third Bridge has 10 shaded camping spots. There are two ablution blocks: the women’s and the men’s sections each have 3 showers, 2 toilets and three wash-basins per side. The ablution blocks are first class, with plenty of hot water from large solar panels. The staff keep these facilities pristinely clean at all times. Please remember that Third Bridge campsite is not fenced, so wild animals have the right of way. If you need to go to the loo at night, it might be safer to get into your vehicle and drive there. That night, with our fire lighting up the large shade tree in the centre of our camp, a small African scops owl landed at our feet while catching the insects attracted by our lights. We had three days to explore the region to our hearts’ content. I will never forget the drive to the pans, literally five minutes from the reception office. With the door of the Sprinter open, and my huge old 600mm lens on its Wimberley Head, I had one of the best photographic afternoons of my life. 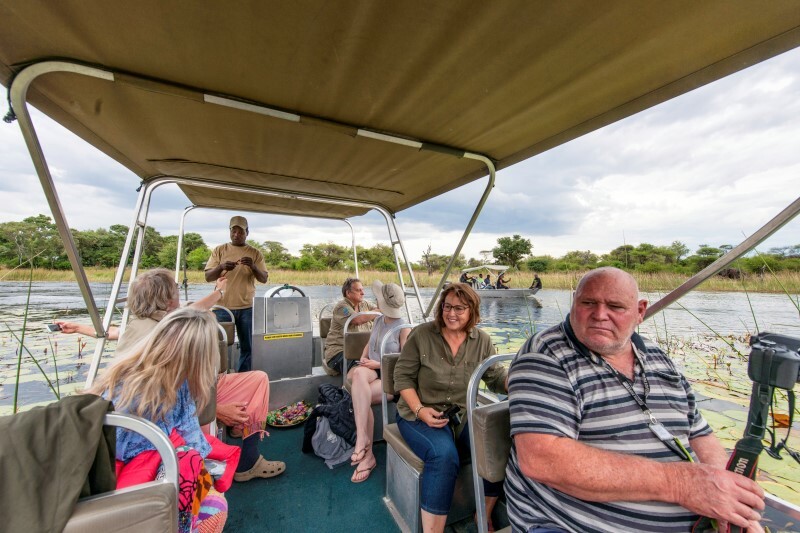 For the next day, Jannie had arranged a trip on an aluminium boat to Mboma Island in the heart of the Okavango Delta, and we left Third Bridge early. 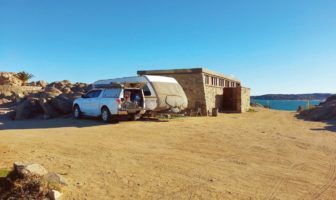 Although it was only some 13km from our campsite to the Mboma boat station, the track consisted of thick sand that wound and wove its way to the boat station. I was impressed by the Sprinter and how easily the all-wheel-drive handled the sand. Our guide was waiting for us. Then, while we were cruising along with tall reeds towering above our heads, we turned the first bend − to find an elephant submerged up to its waist… You have no idea how big a bull elephant looks, towering over a small aluminium boat. Gliding along, with the powerful outboard motor barely ticking over, we passed jacanas, green-backed herons and plenty of Egyptian geese. At one opening in the reed bed, we saw a small herd of red lechwe standing at the water’s edge. We were on our way to Xomae Island. Ansu Rykaart, who has a wonderfully quirky sense of humour, said: “Welcome to Stinky Island!” She was right − one could smell the bird guano from miles away. But the smell paled into insignificance when we gently nosed into the reeds fringing the island: there were thousands of nesting birds, and the cacophony of their calls was deafening. There appeared to be a bird nesting on every shrub, tree and bush on the island. 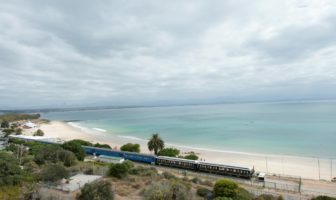 I had to change my long lens to a 24 – 70mm lens. We were so close that my longer lens couldn’t focus; we were looking directly into the nests with their squirming youngsters. In fact, I have described only half the trip so far. 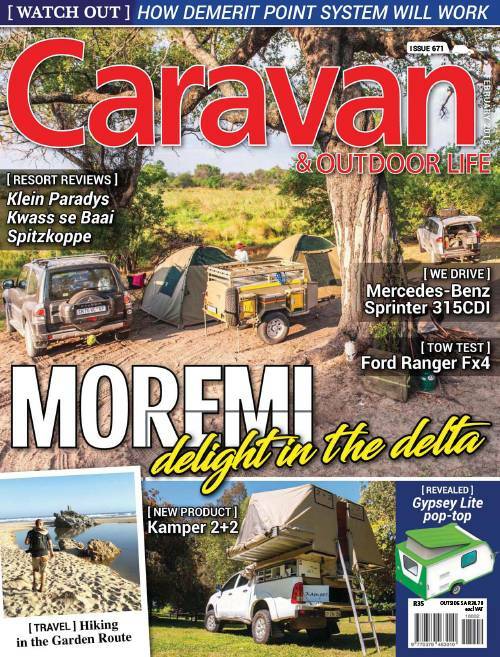 Watch this space for the second half of our Botswana trip, in next month’s Caravan & Outdoor Life.